West Windsor, N.J. – A special photography exhibit featuring Mercer County Community College (MCCC) alumna Alina Bliach ('06) comes to the Gallery at Mercer June 13 to June 24. 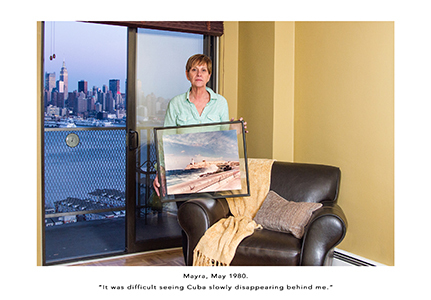 Entitled “A Voyage of Many,” Bliach's exhibit includes images and stories of 45 Cuban immigrants over the past half century in their new American homeland. Each photograph is accompanied by a printed excerpt from interviews Bliach conducted. 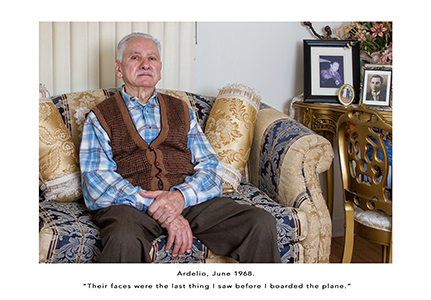 The photos and narratives tell stories of forced exile, escape, loss, hope and triumph. A public reception with the artist will be held on Saturday, June 13 from 6 to 8 p.m. The MCCC Gallery is located on the second floor of the Communications Building on the college’s West Windsor campus, 1200 Old Trenton Road. Gallery hours for this show are Mondays, Tuesdays and Wednesday, 11 a.m. to 3 p.m.; Thursdays, 11 a.m. to 7 p.m.; and Saturday, June 20, 11 a.m. to 3 p.m.
Bliach notes that many of those who came to the United States in the 1960s are now in their 70s, 80s and 90s and most of their stories remain unrecorded. "Since the 1960s more than one million Cubans have immigrated to the United States -- the children of the Peter Pan flights, the people of Camarioca, the Freedom Flights, the Mariel Boatlift, the people known as the Balceros, and the Immigration Visa Lottery winners...Theirs are the stories of sacrifice, perseverance, and survival in their ultimate quest for freedom. These are their portraits,” she said. 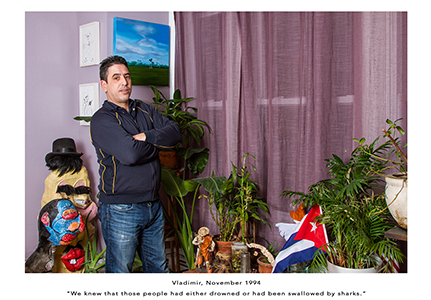 Bliach's portraits are rich in detail that connects their subjects to their Cuban heritage. "Forced to leave their homeland, their love for family, art, religion, and music is often apparent throughout their homes. Photographs of loved ones, brightly colored art and religious relics are proudly displayed ...More than decorations, these objects reveal the deep relationship between these immigrants’ cultural background and the new lives they built for themselves in America," she said. Bliach was born in Havana, Cuba, in 1960. A resident of West Windsor, NJ, she received a Bachelor of Science in Pharmacy from Long Island University in 1986. Unable to stay away from her life’s true passion, she returned to school to study photography, taking her first MCCC photography classes with the esteemed Louis Draper, an MCCC professor who died in 2002. (The college will debut a book of Draper’s work entitled “Louis H. Draper: Selected Photographs” later in June.) In 2006, Bliach earned her Associate of Fine Arts in Photography from MCCC, graduating with highest honors, and is currently pursuing her master’s degree at Savannah College of Art and Design. Bliach has won numerous awards and honors including a finalist in Best of Photography 2013; First and Second Prize honors in the Pollux Awards; Merit Awards in the Professional Photographers of America International competitions; PPA Loan Collection honor; Hasselblad Photographer of the Month; and several International Photography Honorable Mentions. Her work has been exhibited at the Borges Cultural Center in Buenos Aires, Argentina; The Room in SoHo, NY; the Arts Council of Princeton; Grounds for Sculpture; Phillips Mill in New Hope, Pa.; Artworks in Trenton; and Art Along the Fence in Hoboken. More information about this and other exhibits at the MCCC Gallery is available on the Gallery webpage here.